We are having a very warm Indian Summer here in Northern California. Even though it is October, it doesn’t feel like Fall at all. I am still eating homemade ice cream almost every night. It was in the mid 80’s all last week and I had to use an air conditioner all week in my office which is really unusual! I wanted to make something that was more appropriate for Fall so I came up with this recipe for Dairy Free Pumpkin Pie Ice Cream. You might want to PIN this and make it for Thanksgiving. 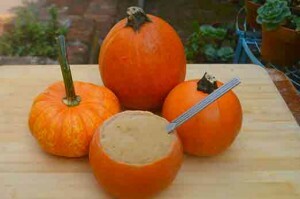 You’ll need a couple of small pumpkins that you can scoop out and use as serving dishes. 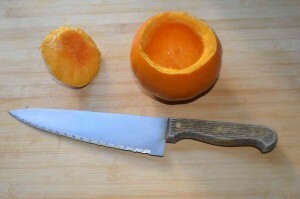 This Dairy Free Pumpkin Pie Ice Cream Recipe is perfect for Fall. Place the coconut milk, pumpkin, sweetener, allspice and vodka if you are using it in a blender. The vodka helps the ice cream to freeze to a better consistency. If you don't want to use it, only make the amount you are going to eat because it won't freeze well without the vodka. Turn on the ice cream maker. It should take around 15 minutes. It is done when it forms the consistency of a soft-serve ice cream.